Today we made our way about 50 nautical miles off shore to the North Florida Marine Protected Area (MPA) accompanied by dolphins and flying fish. 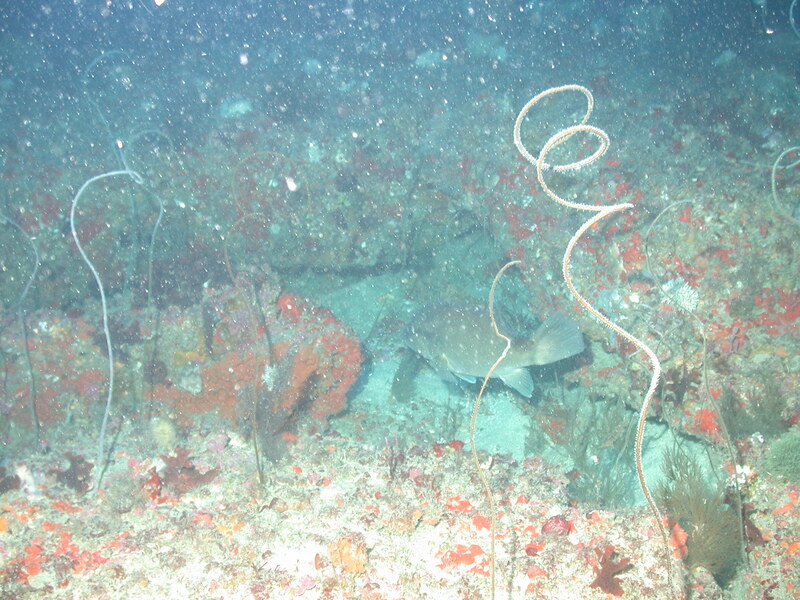 The North Florida MPAs were closed by the South Atlantic Fishery Management Council to bottom fishing in order to sustain and repopulate the following species of fish: snowy grouper, yellowedge grouper, Warsaw grouper, speckled hind grouper, misty grouper as well as golden and blueline tilefish. A second part of our science team is looking at the benthic invertebrates such as corals and sponges as they provide a habitat for the grouper and tilefish to live in. The types of corals and sponges we expect to see in this area include: black coral, whip coral, purple gorgonian, Tanacetipathes, and the stink sponge. We did three Remotely Operated Vehicle (ROV) dives with the Phantom S II. Each dive was between one and two hours long depending on the bottom conditions. The winch from the Pisces would lower the ROV to the bottom of the ocean approximately 50-60 meters deep (164 to 196 feet). The area in the MPA we were looking at had been mapped the night before using the ship’s Multibeam Sonar to give the scientists a better idea of where to look and what type of bottom features they will see. The current at the bottom for a couple of the dives was about 1.5 knots. This made it pretty difficult to spend quality time looking at the species. The Scientists will take this data back to the lab where they can spend more time with each video to fully catalog each species we saw today. Stephanie Farrington and myself are logging data. Once the ROV’s cameras were rolling, the science team was able to begin logging all of the different species that they saw. Each part of the transect line is carefully documented with a date and time stamp as well as a latitude, longitude and depth. 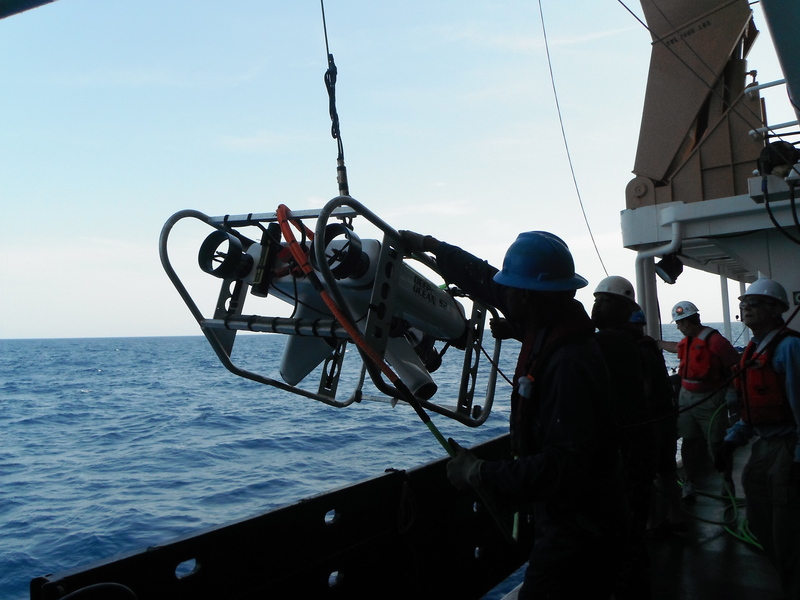 Also mounted on the ROV is a small CTD to collect the temperature and depth every 15 seconds. This will help the scientists match up all of the details for each habitat that we saw with the video on the ROV. While the ROV is at the bottom collecting data, there are several different stations going on in the lab at the time. 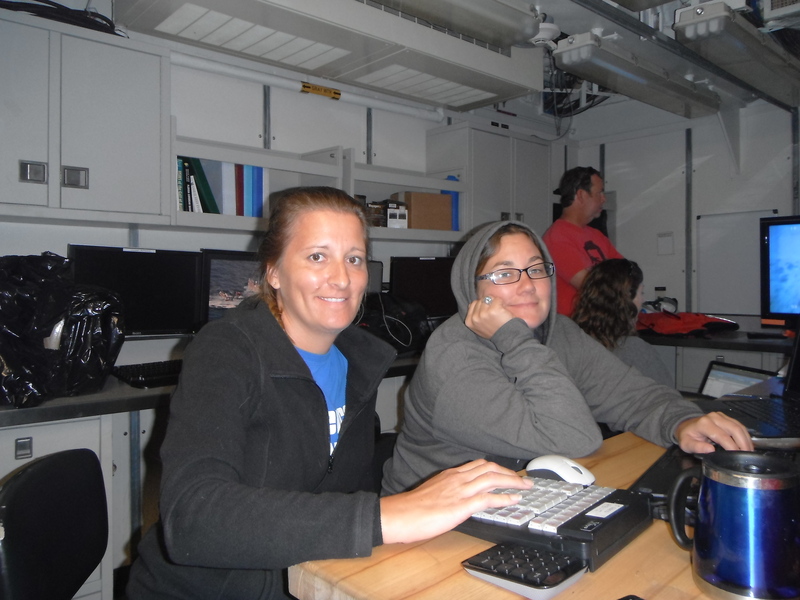 John Reed and Stephanie Farrington are looking mostly at the benthic invertebrates, Stacey Harter and Andy David are cataloging all of the fish they are able to see and identify, and Lance Horn and Glenn Taylor are manning the ROV. There is also a fourth station where one of the scientists uses a microphone to annotate the video as it is being recorded onto a DVD. Today John, Stacey and Andy all took turns at the video annotation station. Basically they are verbally describing the bottom features and habitat they see as well as all the different species of fish and corals. This will make it easier for the scientists when they get back into their home labs as they process their data. For each one hour of video taken it will take Stacey between four and eight hours to catalog each fish found as the ROV passed by. This information is compiled into a report that will be shared with the South Atlantic Council to show if the targeted species are actually making a comeback in these MPAs. The snowy grouper is one of the targeted species. We found this one using the ROV swimming back into his burrow. Today some of the species we saw include reef butterflyfish, vermillion snapper, filogena coral, blue angelfish, purple gorgonian,yellowtail reef fish, black corals, bigeye fish, squirrelfish, wire corals, scamp grouper, hogfish, ircinia sponges as well as a couple of lobsters and a loggerback sea turtle. Tomorrow we will make several more dives at another site outside the North Florida MPA so we can compare this data with the data taken today inside the MPA. 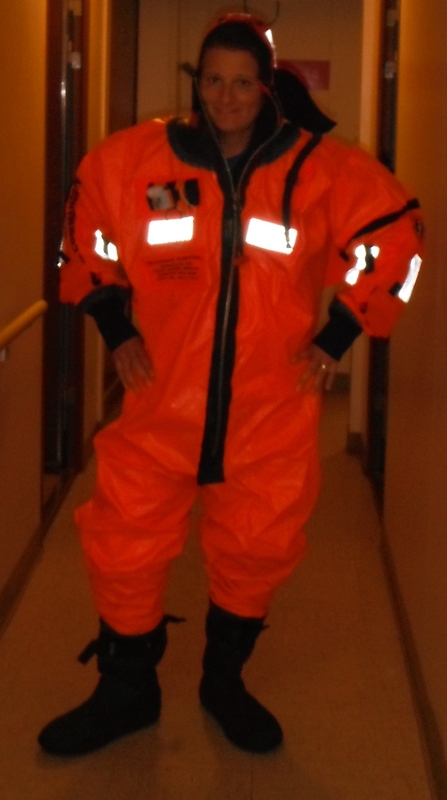 As part of the abandon ship drill, we had to be able to don our immersion suit in less than three minutes. Life on the ship is really different in some ways compared to life on land. There is the constant rocking of the ship, which my inner ears are not very fond of. The bedrooms are not the biggest and we each share with one other person. I am rooming with Stephanie Farrington and she is very easy to get along with. The food has been great — it would be very easy to gain weight while working on the Pisces. The stewards do a fantastic job preparing meals for everyone on the ship. Meal times are the same each day, breakfast is from 7-8 am, lunch is from 11am to noon, and dinner is from 5-6pm. If someone is working the night shift, they can request that a meal be set aside for them so they can eat later. In this section, I will be interviewing scientists and crew members to give my students ideas for careers they may find interesting and might want to pursue someday. Today I interviewed Stacey Harter, the Chief Scientist for this mission. What is your job title? I am a Research Ecologist at NOAA Fisheries Panama City Lab. What type of responsibilities do you have with this job? My responsibilities are to acquire funding for my research, as well as plan the trips, go on the cruise to gather the data, and analyze the data when I get back. I am also collaborating on other projects with NOAA Beaufort in North Carolina and St. Andrew Bay studying the juvenile snapper and grouper populations in the sea grass found at this location. What type of education did you need to get this job? I got my Bachelors degree in Biology from Florida State University and my Masters degree in Marine Biology from University of Alabama. What types of experiences have you had with this job? My best experience I’ve had was getting to go down in a manned submersible to a depth of 2,500 feet to study deep water corals and the fish that live there. What is your best advice for a student wanting to become a marine biologist? Do internships! This is the best way to get your name out there and to make connections with people who might be able to get you a job after college. I had an internship at the NOAA Panama City Lab while I was in graduate school which helped me to get my job with NOAA when I graduated. 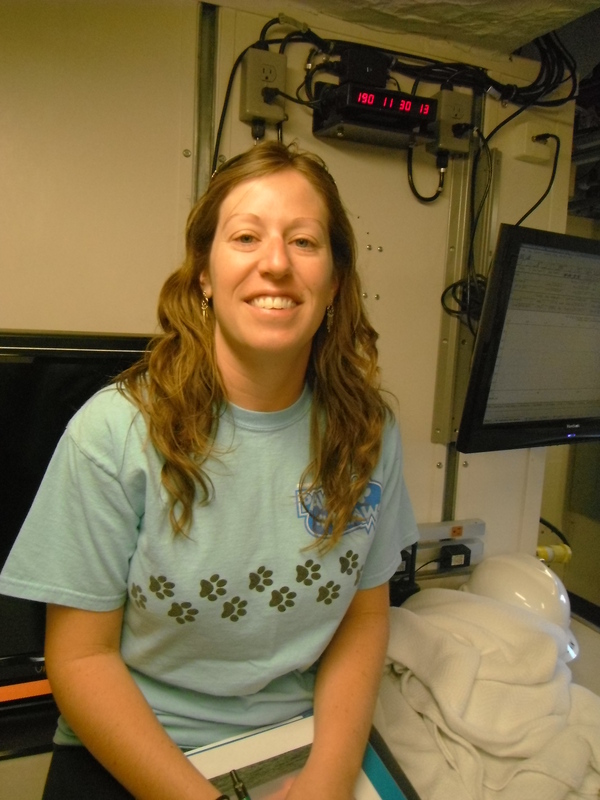 This entry was posted in 2012, Marsha Skoczek, NOAA, NOAA Fisheries Service, NOAA Teacher at Sea and tagged Careers, corals, CTD, grouper, Marsha Skoczek, multibeam sonar, NOAA, NOAA Teacher at Sea, Remotely Operated Vehicle, ROV, snapper. Bookmark the permalink. Landen, that is a great question. Last year, the scientists wrote a grant and received funding from the South Atlantic Fishery Management Council to study the South Atlantic MPAs. 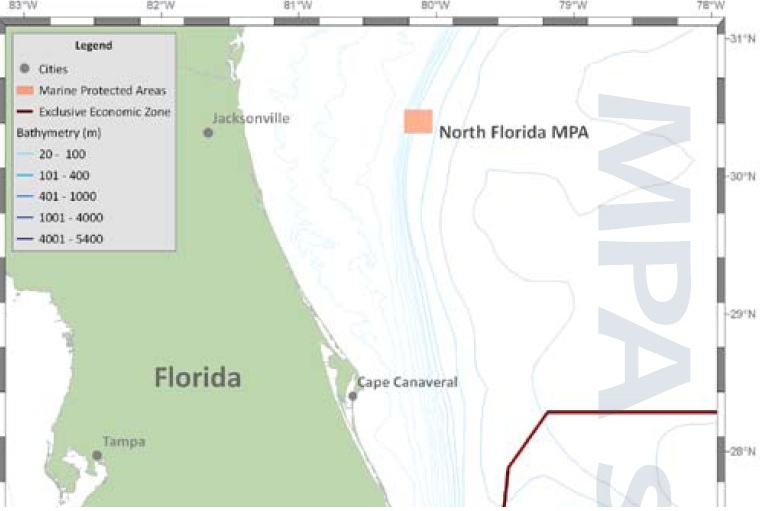 This is a three year grant and the information they collect will help determine if the MPAs are having a positive influence on the targeted grouper and tilefish species. What is the greatest depth the ROV can reach? The ROV itself can actually reach to a depth of 1,500 feet, but we are limited to the length of the tether line that hooks the ROV to the ship, so for all intensive purposes, the ROV can reach depths of 1,000 feet. How long does it take to get funding and once you have funding how long does it take to get ready for a trip this big? Are there alternate people picked as back up if someone cannot go? Aly, this trip was funded as part of a three year grant from the South Atlantic Fisheries Management Council. Planning for this year’s cruise began last year with Stacey and Andy reserving time on board the Pisces and making arrangements with the ROV team, the geographer, and the scientists from HBOI. Approximatley how many Marine Protected Areas (MPAs) are there worldwide?